Academic examinations are considered to be an important part of an education system. Exams show that the students have acquired knowledge about the particular subject or discipline. Students often feel pressure because the exams, as its going to assess them on the basis of marks. The assessment becomes more of a competition which leads to anxiety, stress and pressure. 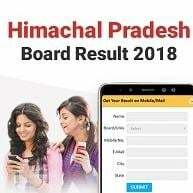 Click here to check HP Board +2 Result 2018. Believe in yourself: One need to believe in their doings. You need to keep faith in yourself. The year full of preparations, assessments will pay off. This time shall too pass. ‘Me’ Time: It’s time for your hobbies. The year was really busy academically, Opting your hobbies always helps whether its sports, music or even watching movies. Eat and sleep: One need to take care of their sleeping and eating pattern. It is more important to eat and sleep well. Healthy body, healthy mind. Always practice. Meditate: To get rid of stress, start meditating. Give an hour to yourself in a day and meditate. The concentration level and thinking will change for a good.